Today I am excited to have Christine Nolfi, author of Treasure Me, here to answer a few questions for me. What drew you to write about a treasure hunt? Treasure Me is the first book in the Liberty, Ohio series. All of the novels blend U.S. history with personal mysteries unearthed by principal characters. I used the device of Birdie’s treasure hunt to introduce the plotline of Justice Postell, a freed slave from the Civil War era. Justice’s life—and the possessions she left behind—will impact many of the characters in future books. Why start the series with a black slave from Charleston, South Carolina? Well, my late mother’s family is of French and English descent. My French ancestors arrived in Charleston not long after the Revolutionary War. The history is sketchy, but they may have been plantation owners. Given that, I’ve always wondered if I have black relatives I’ve never had the privilege to meet. This question is dear to my heart. Sixteen years ago, I adopted a sibling group from the Philippines and questions of skin color were common around the dinner table when my children were growing up. I hope I portrayed in Treasure Me that “family” has nothing to do with skin color and everything to do with finding people to love, and who love you in return. To ensure story logic, I read general histories of the Civil War and first-person accounts of slaves who escaped north on the Underground Railroad. The research certainly isn’t complete, not yet—readers will learn more about Justice in the third book of the series, The Impossible Wish. This book seems to be all about second chances. Do you believe everyone deserves a second chance? Of course! Life offers many opportunities to start over, which is why the theme of redemption carries through the entire series. I was interested in building a realistic cast of characters to populate Liberty, Ohio, the kind of people you meet every day. We’ve all made mistakes in our lives; it’s compelling to read about seemingly ordinary souls who achieve the extraordinary. Not directly, although people I’ve known certainly influence the traits of many characters in my novels. Usually I begin a new project with the kernel of an idea, a conflict. The characters most apt to struggle with that particular issue begin to appear in bits and pieces. It’s rather like molding a sculpture from clay with the final result hidden for many months. I’m the single mother of four, young adult children. Balancing my personal and professional life is never easy. This becomes especially difficult as the writing progresses, and I become immersed in the plot of a particular work-in-progress. My kids are real troopers—they’ve grown up with a mother who is a novelist, and they understand the demands. Becoming lost in my characters. By mid-book, I’m utterly convinced they’re real people and I’m simply recording the critical events in their lives. It’s a delicious experience. Honestly, I can’t recall a time when I didn’t write. Poems. Short stories. Later, novels. After college, I owned a small public relations firm. But I was always moving toward the day when I’d write fiction. Like all writers, I began with an insatiable hunger for books. When I was a child, I used to wander through libraries drawing my fingertips across the spines of books. I felt like I was touching other souls, reaching into other lives I would only know through their words. Digital publishing offers a marvelous opportunity for talented authors—especially authors who don’t fit easily into a traditional genre—to reach the reading public. Random House was interested in the next novel in the series, Second Chance Grill, which will appear on Amazon this summer. A division of Penguin considered bringing Treasure Me, and the entire Liberty, Ohio series, out in hardcover. In both instances, the editors were flummoxed. Were the books romance or women’s fiction? Or something else? The prose was close to literary, with cozy mystery elements and snappy dialogue. Given the financial investment a publishing house makes releasing a debut novelist, it’s understandable why both editors were hesitant to offer a contract. They weren’t sure, exactly, how to promote my works. That said, I don’t believe traditional books will ever disappear. Don’t we all love the scent of a newly printed book? The feel of a hardbound book in our hands? The affordability of e-books will certainly increase readership, but a segment of the public will always prefer print books. Absolutely. Treasure Me is the debut book in the series and I relied on review feedback to make important decisions, such as, “When should I release a paperback version?” Given the positive response, I’ll do that quickly. Find a specific time of day to write, even if only for a few minutes. Join a critique group to improve your craft. Don’t diminish your wellbeing by pulling all-nighters pounding out fiction. This isn’t a college exam. Producing your best work comes with time, reading often and well, and having the courage to put emotion on paper. I love to hear from readers at my blog and through email. Christine owned a small public relations firm in Cleveland, Ohio. Her articles and press releases have appeared regionally in northeast Ohio. Her short story, Night Hour, appeared in Working Mother magazine. Christine closed the firm fifteen years ago after she traveled to the Philippines and adopted a sibling group of four children. She has been writing novels fulltime since 2004. 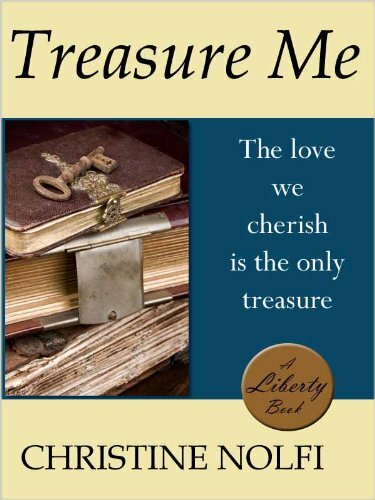 Treasure Me is the first book of the Liberty, Ohio series, available at Amazon. Want to win a copy of Treasure Me? I have an ebook copy (PDF/ePub/Kindle) to giveaway to one lucky visitor. Entry is very easy, just follow the author through either Twitter, or her blog and complete the form below. The giveaway is open worldwide until midnight July 21, 2011. A winner will be chosen at random and contacted by email. They will have 48 hours to respond with the chosen ebook format, or a new winner will be chosen. Comments for Christine would be greatly appreciated, but will not affect your entry into the giveaway. Many thanks for featuring Treasure Me on your blog. Thank you for the wonderful interview and giveaway opportunity.